Prof. Nguyen TK Thanh FRSC is Professor of Nanomaterials and has over 15 years of research experience in materials chemistry, synthesis and biofunctionalisation of nanoparticles. 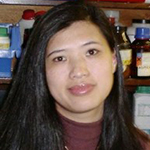 Her work is focussed on the chemical synthesis of various Au, Ag and magnetic nanoparticles. She has published over 70 papers and book chapters. Her papers received over 550 citations in 2015 alone. Research highlights include the development of biocompatible iron oxide magnetic nanoparticles using co-precipation method using sodium carbonate in a microwave reactor, polyol synthesis, functionalisation of superparamagnetic iron oxide nanoparticles as potential MRI contrast agents and a novel strategy for delivering functionalised superparamagnetic iron oxide NPs to the outer surface of pancreatic islet grafts for tracking them by magnetic resonance imaging (MRI). She has been an invited speaker over 120 institutes and scientific meetings and served on over 20 scientific committees for many major international conferences on Nanoparticles such as MRS, EMRS, MRS Singapore, ACS, RSC-SCI UK Colloids 2011, 2014 and 2017. She was the Guest Editor of Philosophical Transactions of the Royal Society A on “Nanoparticles” theme issue published in September 2010. She edited a seminal book: “Magnetic nanoparticles: From fabrication to clinical applications” published by CRC Press/Taylor and Francis, 2012. She is also the Editor of Royal Society of Chemistry (RSC) Nanoscale themed issue ""Functional nanoparticles for biomedical applications"" published in 2013. She was the scientific chair and editor of RSC Faraday Discussion 175 “Physical Chemistry of Functionalised Biomedical Nanoparticle"". She is advisor of Mag(net)icFun, an EU Training Network which focuses on the application of functionalized magnetic nanoparticles in Chemistry and Biomedicine. She also serves on the Management Committee for EU COST Action TD1402 Multifunctional Nanoparticles for Magnetic Hyperthermia and Indirect Radiation Therapy (RADIOMAG). In this presentation the most recent results of our group on synthesis and functionalisation of nanoparticles for biomedical applications will be shown.